News just in of two additions to the motor yacht sales fleet of Josh Gulbranson at Fraser Yachts: the 37.19m Andiamo and 23.5m Happy Fish. Firstly, Andiamo built by Azimut in 1983, rebuilt in 1996 and extensively refitted again in 2009. Because Andiamo was originally built for the Royal Family of Kuwait and has since been extended and completely refitted twice, the yacht features an extremely accommodating layout with spacious inside and outside spaces. 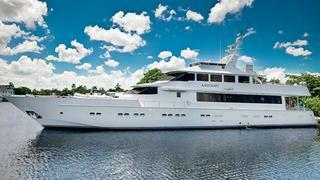 Andiamo went through an extensive, multi-million dollar four year refit that was completed in 2009. Every aspect of the interior guest and public areas was completely redone, as were most of the exterior spaces of the yacht. All new, high-end Makore wood cabinetry with Absolute black granite counter tops was installed throughout the dining area, main salon, bar areas, and each suite. Likewise, all new headliners, stainless steel down lights, wall coverings, window coverings, floor coverings, doors, furniture, and furnishings were installed during the refit. The cockpit deck and massive sky lounge deck were reconfigured for al fresco dining in each area. Andiamo accommodates 10 guests in five staterooms while twin 1960hp MTU engines give her a range of 1,000 nautical miles at 10.5 knots. Her asking price is $2.95 million. As her name implies, Happy Fish is a sportfishing motor yacht built by Hatteras in 2008. A fine high gloss cherrywood interior sleeps eight guests in a master suite, two double staterooms and a convertible twin cabin while twin 2400hp MTU engines give her a cruising speed of 30 knots. Happy Fish is asking $4.15 million.